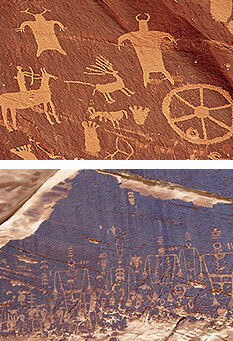 Petroglyphs are images that have been carved, pecked, chipped or abraded into stone. The outer patina covered surface of the parent stone is removed to expose the usually lighter colored stone underneath. The word comes from the Greek words petros meaning "stone" and glyphein meaning "to carve" (it was originally coined in French as pétroglyphe). The term petroglyph should not be confused with pictograph, which is an image drawn or painted on a rock face (described below). Both types of images belong to the wider and more general category of rock art. Petroglyphs are found world-wide, and are often (but not always) associated with prehistoric peoples. Petroglyphs have been found in all parts of the globe except Antarctica with highest concentrations in parts of Africa, Scandinavia, Siberia, southwestern North America and Australia. The oldest petroglyphs are dated to approximately the Neolithic and late Upper Paleolithic boundary, about 10,000 to 12,000 years ago. Around 7,000 to 9,000 years ago, other writing systems such as pictographs and ideograms began to appear. Petroglyphs were still common though, and some less advanced societies continued using them much longer, even until contact with Western culture was made in the 20th century. Today, Petroglyphs are an intriguing part of historical native cultures that ignite the imaginations of those who venture to their remote locations throughout the world. Pictographs are symbolic images representing an object or concept that are painted or drawn onto stone faces. These pictographs are much more fragile than petroglyphs due the medium used to create these eye catching images. Paint was created with a mineral or vegetal substance for color, combined with a binder such as fat residue or blood. Although the majority of the images were traced with the finger, some could be executed with brushes made of animal or vegetal fibers. Red, ochre, white, and black were the most common colors used. Pictographs were primarily painted in locations where they would be protected from the elements including caves, alcoves, under ledges and overhangs.